Ultra-thin and light weight design, you can take it anywhere, diffuse reflection effect make the light more evenly, good for protecting your eyesight, with the soft, stable and non-flickering lighting, you can enjoy what you\'re doing for longer. Also is a fabulous gift choice! 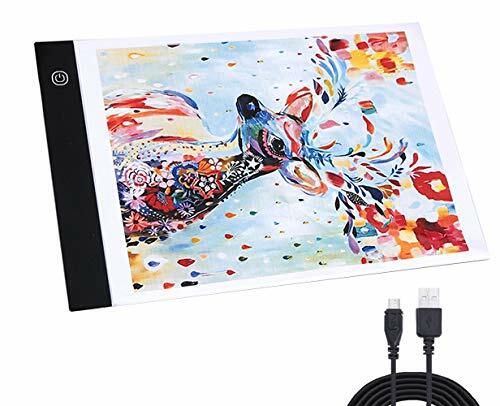 Material: Acrylic USB Input Voltage: DC 5V Whole Size: 33 x 21cm / 13 x 8.28inch Working Area Size: 30 x 21cm / 11.81 x 8.28inch Thickness: 0.35cm / 0.14inch Package Included: 1 x Diamond Painting LED Light Pad 1 x USB Cable Note: 1.USB cable included, but no adapter. 2.Please allow 1-3mm error due to manual measurement. Thanks for your understanding. ▲Satisfaction Guarantee: If the item you received is defective, or you are not satisfied with your purchase, please contact us immediately, we promise every customer unconditional replacement or a refund.